Outstanding all-time great in baseball history. The fans all across the country voted Stan "The Man" Musial as a starter into most All-Star games during the 1940's & 1950's. Stan was in the U.S. Military during 1945. Musial won the Most Valuable Player Award in 1943, 1946, & 1948. This all time great was among the leaders in batting throughout his career. 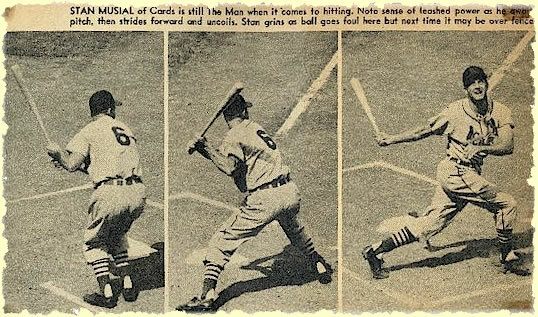 Musial's hot hitting was evident when he led the St. Louis Cardinals to four (4) pennants in five (5) years (1942-1946) and when the Cardinals won the World Series. In 1954, Musial established a new major league record by hitting five (5) home runs in a doubleheader. Musial dominated the sporting headlines all during his career. In 1958, Stan registered his 3,000 lifetime hit against the Cub's pitching star, "Moe" Drabowsky. Highlights of Musial's great career include .331 lifetime batting average along with 3,630 hits, 725 doubles, 177 triples and 475 home runs. 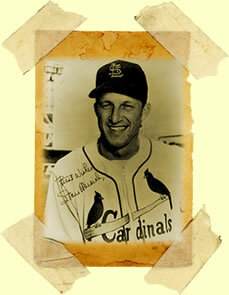 Stan "The Man" Musial owned the National League with his torrid bat during the 1940's & 1950's.